ITV Digital (formerly Ondigital) was the UK carrier of Digital Terrestrial Television (DTT) and was a joint venture between UK operators Carlton and Granada. ITV Digital was placed in to Administration in April 2002, and screens went blank on 1st May 2002. The BBC and Sky joined forces to form a new DTT company, which launched on 30th October 2002 under the name Freeview. channels are free to view. Even after the demise of ITV Digital, their major success story ‘Monkey’ lived on… at least for a while. Until 2005, it was possible to buy Monkey from online from The Gadget Shop , but it looks like their doors have finally closed to Monkey stock. Jan 2003 –1 million ITV Digital boxes won’t be reclaimed! Following December’s controversial announcement from the liquidators that ex-subscribers would have to pay £40 for their old boxes, ITV Digital’s former parent companies Granada and Carlton have agreed to have agreed pay itvDigital’s Administrators, Grant Thornton, the cost of the 990,000 outstanding boxes plus any subscriptions still owed. Anyone who paid to keep their box, will be getting a refund. This decision has most likely been made so that ITV will gain extra viewers for ITV2 and ITV News, now running free-to-air on Freeview. Dec 2002 – 1 million ITV Digital boxes to be reclaimed! If you have, or had, a subsidised onDigital/ITV Digital box, then the administrators want it back. They have agreed to collect boxes for free, or let you keep the box for £39.99. This has sparked a huge debate on various newsgroups, about who owns the boxes, what happens if you refuse to pay (debt collectors…), and whether box holders can change a “storage fee” for looking after the boxes since May 2002. The debate is ongoing, but it would appear that When you signed up to onDigital/ITV digital, you agreed to two things… a “Provision of programming” agreement (which has been broken as the service is no longer being offered), and a “Box loan agreement”, which has not been broken. Unless you purchased an unsubsidised box, or for some other reason, didn’t sign the contract, you don’t own the box… itvDigital’s Administrators, Grant Thornton, do… and they want them back! More set-top boxes announced. The Pace DTVA-T, Grundig GDT1500 and the Panasonic TUCT20 became available for under £100, and the Pace DTR73 FTV for under £80. The most expensive unit was the Nokia Mediamaster for around £120, although refurbished units were available. Although ITV Digital is no more, existing ITVDigital/OnDigital boxes can still pick up the free-to-air channels, including BBC 3, CBBC, cBeebies, BBC4, ITV2, ITN, the shopping channel (please…) plus the usual 5 terrestrial channels. Up to 15 channels are available without subscription via your TV aerial (provided you’re in a coverage area). If you want to expand your viewing choice without getting cable or a dish on the wall, the free-to-air channels may be enough. For under £100, the Pace digital TV adapter may well be worth a look, offering remote control, subscription-free access to the free-to-air channels. 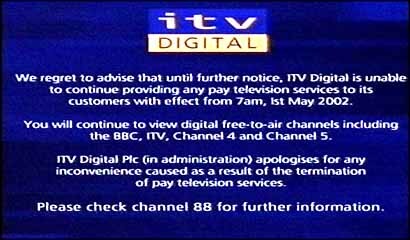 Update: 25 April 2002 – ITV Digital collapses. Click here for the story. 22 April 2002 – ITV Select suspended. Following today’s announcement that ITV Digital is up for sale, pay-per-view services appear to have ceased. 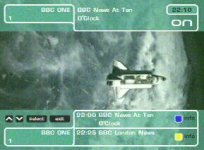 The on-screen message states: “This service will not be transmitting for the time being”, despite the note on the ITV Information channel (88) that it’s business as usual. itv Text+ also appears to be off (channel 16). 27 March 2002 – ITV Digital now in administration. City firms estimate the cost of closing ITV Digital could rise to as much as £400 million, including £200 million to shut down ITV Sport. Rebecca Allen, media analyst at JP Morgan, says ITV Digital was losing at least one customer for every four it recruited – a churn rate of 25%. Digital TV explained – Information on UK Digital TV options, such as Sky, Freeview and cable. Freeview Set-top Boxes - Unlimited data on Three? Consider Netgem TV boxes! Internet TV and Catch-up TV Discussion - Stopping Facebook In Its Tracks?